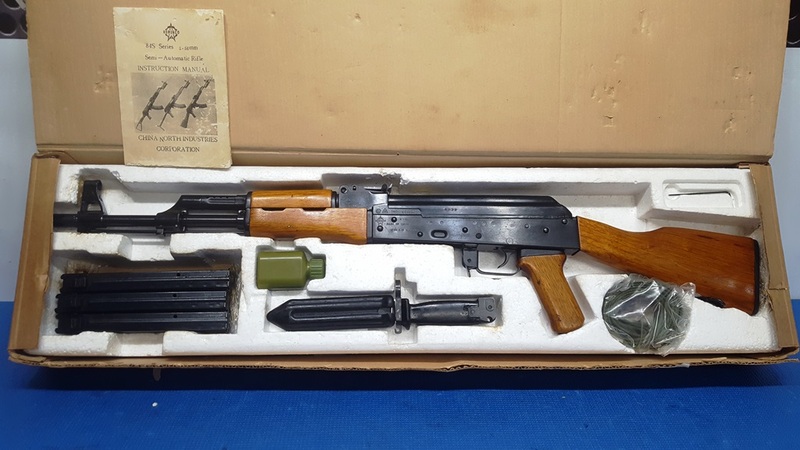 Norinco Model 84S Semi-automatic 5.56mm Rifle in original box. Gunis NEW IN BOX 100% Test fired only and put away years ago. Comes with all matching numbers box, gun, carrier, bolt, top cover and box, they all match. This is an AK47, 84s-1 in 5.56 caliber rifle, chambered for the 5.56mm Nato cartridge. This rifle is in the original box. It includes three 30 round magazines, a bayonet, a cleaning kit, instruction manual, and a sling. ALL ORIGINAL LNIB AND IN MINT CONDITION! This is a like new in box gun, It is all in excellent condition. The cardboard box is in good condition also. These came in like this in the late 1980's, and Its an original Norinco Model 84S Rifle. This is an AK47, 84s-1 in 5.56 caliber rifle, chambered for the 5.56mm Nato cartridge. This rifle is in the original box. It includes three 30 round magazines, a bayonet, a cleaning kit, instruction manual, and a sling.